Wasikowska plays Edith, the daughter of a wealthy businessman, who meets down-on-his-luck aristocrat Sir Thomas Sharpe (Hiddleston) and falls for his charms, but her father does not approve. He is soon taken care of, they marry and Thomas takes her back to his home in England – the creepy, disintegrating Allerdale Hall, where he lives with his sister Lucille (Chastain). Something is not right with the house, or the siblings, and the ghosts are trying to send Edith a warning. 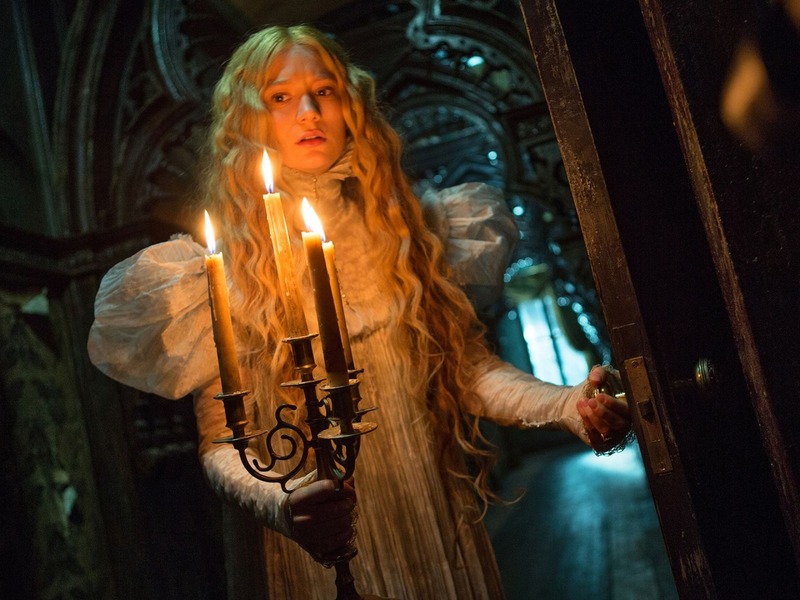 Crimson Peak most obviously excels with set design, costumes and basically, everything you see is gorgeous. The Hall is slowly submerging into the red clay, snow drifts into the grand hallway due to the gaping hole in the roof, and there are endless rooms and hallways to get lost in. It lends itself to the gothic vibe and it is cold and dark like its inhabitants. Besides the Hall, I loved the clothes so much – especially Edith’s, they were stunning. The substance doesn’t quite match up. It slowly builds the atmosphere and tension, the creepiness of the house and the questionable motives of the Sharpes. Horror fans will not be thrilled – but, to be fair, it has always been pitched as a gothic romance rather than a horror. Not much happens when they arrive at the Hall besides ghosts visiting Edith and the slow reveals about the Sharpe history. But it 100% ramps up when things really start to unravel and I loved seeing the characters become unstuck. The last half hour, my God, was exhilarating and nail-biting and the performances were on top form. It isn’t the most original story but the performances and visuals make it so damn good. Chastain proves once again what a remarkable actress she is. Lucille is very dark, twisted and does not care for the lives of others. You really see her mental instability at the end and it is AMAZING. She looks so freakin’ crazed!! Hiddleston was good but he only really got to shine towards the end and Wasikowska does a great job of carrying the film. I must also credit Charlie Hunnam for his role as Edith’s friend Dr. Alan McMichael, who has a very vital part to play. 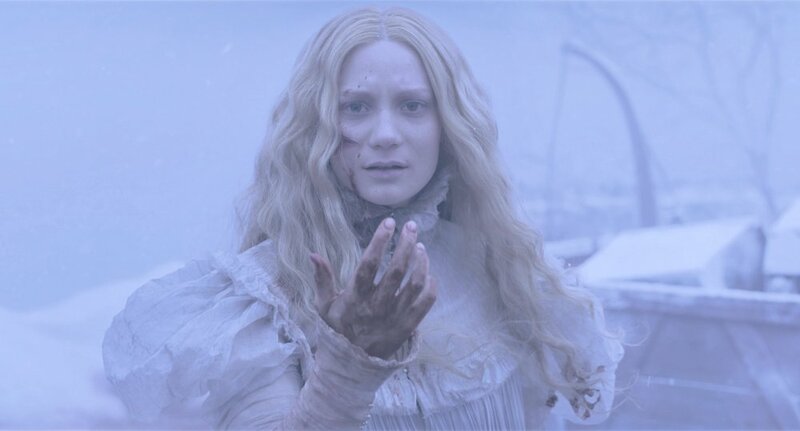 Crimson Peak will probably disappoint horror fans because it isn’t that scary. There were a few jumps and I braced myself behind my coat a couple of times, but that sense of terror quickly dissipates when you see the ghosts up close as they are so obviously CG. However, as someone who doesn’t love horror, this was awesome. It does take a while to get moving but I enjoyed watching events slowly build into an almighty crescendo.